We have just got back from demonstrating at Tatton Park and the CLA at Belvoir Castle. 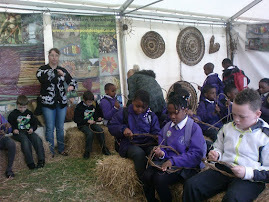 Simone had a great time at Tatton despite being unwell and arranging for Sonia to stand in, and met a lot of prospective schools for work over the living willow season. 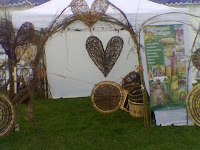 The Basketmakers Association also had a display at Tatton but they didn't seem to be interested in our work despite the fact that we are actually members of the association and that many of the 'sculpture at school' ideas originated with us. I suppose that we should be flattered when our ideas are are copied but I always find it strange when they are on display at a nearby exhibit. But I guess that's life. Our friends at BHMAT, the woodland apprentice scheme from Cumbria, were very supportive throughout the event. Steve enjoyed meeting up with old green woodworking friends at the CLA and had a lovely time catching up on the news. Our next event is at Art In Action at Traquair House in the Scottish Borders at the weekend.